Orthodox chants performed by the Madrigal Sofia Chamber Choir. The Madrigal Sofia Chamber Choir was founded in 1972. Madrigal's repertoire covers mainly Renaissance and Baroque works- madrigals, motets, canzones, cantatas by Monteverdi, Lasso, Gesualdo, J.S.Bach, Vivaldi. Another part of their repertoire are the 20th century composers like Prokofiev, Stravinsky, Debussy, and Slav music by Tchaikovsky, Dobri Hristov, Peter Dinev, Rachmaninov. Soloists: Alis Bovarian, Nikolina Pankova, Sasho Kostov, Alexander Deyanov, Martin Pashovski, Dimiter Derliev, Plamena Zlateva, Snezhana Karoleva, Iolanta Tsaneva, Dimitry Gambourtsev. The release contains one of the most significant compositions of Peter Dinev - a person with great services to the preservation and research of medieval Bulgarian music. As a musicologist and pedagogue, he dedicated himself to Orthodox music. 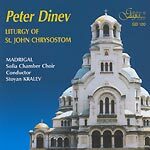 For many years Dinev worked on the "translation" of the ecclesiastic characters into modern linear notation, which created opportunities for a number of liturgical works from the first centuries of Christianity in Bulgaria to be included in the repertoire. The recorded tracks are the composer's elaboration of old Orthodox chants done with mastership and inspiration. By interweaving of voices and timbres, the conductor, Stoyan Kralev has outlined the beauty of the choral songs laying the stress on the contrast between the sonority and elevation of the solo participation in prayers, rich in tenderness, humbleness and faith. With their emotionality and abundance of vocal skills and musical nuances the performances of Madrigal Chamber Choir draw the listener's attention, filling his heart with good will, kindness and love for people and God. 1 By the rivers of Babylon 8'44"
3 Bless The Lord o my soul 2'17"
4 Small litany - Glory to Lord and the Son 5'17"
5 In thy Kingdom - Come let us worship 5'40"
6 Cherubic song - As you Reign 7'22"
7 The Lord and the Son 1'00"
8 Mercy of Peace - We sing thee 7'04"
9 Meat it is 3'39"
11 Rejoice, virgin Mother of God 1'13"
12 The judicious Villain 2'16"
13 Praise Ye the Name of Lord 2'16"
14 Christ is risen I - Christ is risen II - Grant, o ,Lord many years 6'26"